What if the bomb that exploded in Oklahoma City or New York's World Trade Center had used 100 pounds of highly enriched uranium? The destruction would have been far more vast. This danger is not so remote: the recipe for making such a bomb is simple, and soon the ingredients might be easily attained. Thousands of nuclear weapons and hundreds of tons of weapons-grade uranium and plutonium from the weapons complex of the former Soviet Union, poorly guarded and poorly accounted for, could soon leak on to a vast emerging nuclear black market. This study by Graham Allison and three colleagues at Harvard's Center for Science and International Affairs warns that containing the leakage of nuclear materials--and keeping them out of the hands of groups hostile to the United States--is our nation's highest security priority. As the most open society on a shrinking planet, the United States has no reliable defense against smuggled weapons fashioned from black-market materials by a determined state or terrorist group. 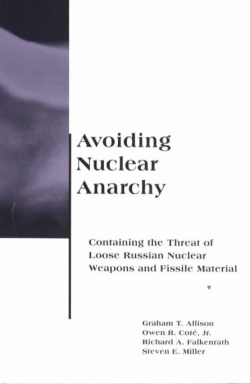 Avoiding Nuclear Anarchy highlights the fact that the only way to combat the threat is by preventing nuclear leakage in the first place. Its message is both timely and urgent: it outlines the new nuclear danger and details how to reshape U.S. national security policy to deal with these dangers.